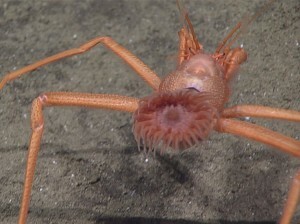 As the deep sea exploration in the Marianas Trench reaches another week in the 69 day expedition, we enter the second week of posts about amazing deep sea animals pictured during the expedition. Special thank you to the expedition team for making these pictures available and the guys at Discover Magazine for making the pictures available to the public. We start this week with a look at this amazing picture of an anemone sitting on top of a hermit crab. It is said this anemone secrets a shell of shorts for the crab to inhabit instead of a shell. Such a relation ship where both animals benefit from each other is a symbiotic relationship whereas a parasitic relationship is when one of the two animals will only be benefiting with nothing provided back to the host. Relationships between the anemone and other species of hermit crabs are well documented – often, when the crab outgrows their shells, they will transfer the anemone from the old shell to a new one. This entry was posted in Conservation, Creature feature, Deep Sea, Marine Biology, Science and tagged 2016 Deepwater Exploration Marianas, deep sea anemone, deep sea hermit crab, hermit crab, sea anemone, Symbiotic Relationship. Bookmark the permalink.